Spinal tumors are neoplasm’s located in the spinal cord. They are mostly metastases from primary cancers elsewhere (commonly breast, prostate and lung cancer). Primary tumors may be benign (e.g. haemangioma, Neutofibroma, Menningioma, Epidermoid) or malignant in nature. Any section of the spine can be affected, from the top of the neck down to the sacrum. Tumours can occur in the spinal canal, outside the membrane (dura), enclosing the spinal canal and nerve roots (extradural or epidural). 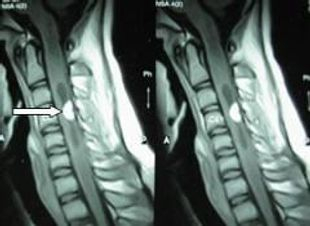 They can be inside the dura (intradural), and very occasionally they may arise within the spinal cord (intramedullary). Spinal tumor treatment often requires the expertise of several specialists including a spine surgeon, neuroradiologist, pathologist, oncologist, and pain management specialist. The type of treatment usually depends on the patient’s symptoms and health, imaging studies, and biopsy results. Many patients require a combination of non-surgical and surgical treatments. Each case is evaluated on an individual basis and the treatment is designed to meet the patient’s needs.